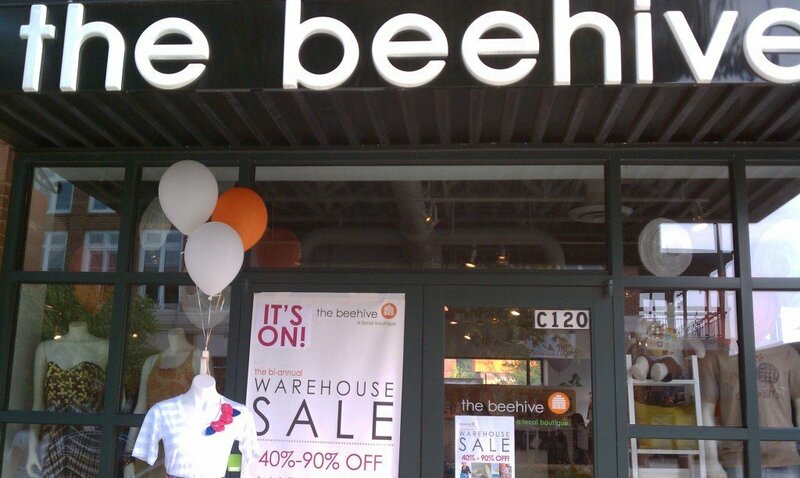 The warehouse sale at the beehive is a fabulous event! It happens twice a year: once in January and once in August. The entire store gets turned upside down and rearranged to make room for all the product that gets sold at the sale. So what is the warehouse sale exactly? It is handmade products (or supplies we use to make products) that have been marked down 40%-90%. Though, I will tell you, I always include at least one FREE item in my sale section. What types of things can you expect to find at the warehouse sale? Which designers participate in the sale? I’ll be honest, not all the designers participate. But a LARGE majority of us do. So expect to find everything you’d normally buy from the beehive. Examples would be jewelry (crafts and love and cameoko ALWAYS have great deals on their beautiful lines), housewares like tea towels, candles, luggage tags, fun quirky art (like that of paper bones), baby items (obviously), and loads more! So why should I shop the warehouse sale? First and foremost, you’ll be supporting not only a brick and mortar shop during a generally slow sales month, but also nearly 100 individual artists like myself. Doesn’t it feel good to support your community? 🙂 Also, the August sale is a great time to shop for the upcoming winter holidays because you’ll be able to get so many handmade, unique gifts at such great prices! And if neither of those appeal to you, shop it cause stuff is dirt cheap…so treat yo’self! The August 2018 sale starts this Saturday, August 25th at 9 am. The official end of the sale is Sunday, September 2nd. The address is 1250 Caroline Street, Suite C120, Atlanta, GA 30307. Come out and support local! Vote for a free bodysuit! Check out the top post on inside the little nest to get details on how to win a free bodysuit!